Novartis could take the top spot from Pfizer in prescription-drug sales by 2022. So what? Pfizer (NYSE:PFE) stands at the top of the mountain when it comes to prescription drug sales. 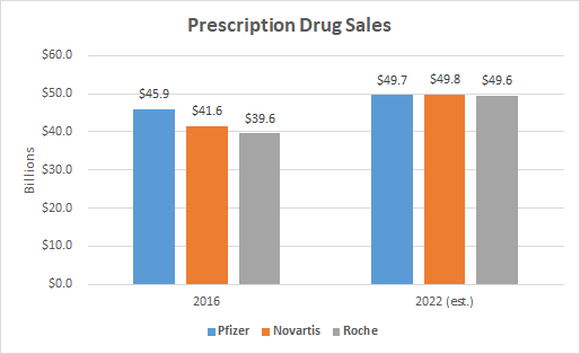 Last year, the big pharma company made $45.9 billion from prescription drugs, well ahead of runners-up Novartis (NYSE:NVS) and Roche (NASDAQOTH:RHHBY). However, Pfizer appears likely to lose its No. 1 spot among drugmakers. According to research firm EvaluatePharma, Novartis should push Pfizer out of the top position by 2022. Should Pfizer shareholders be concerned? Not at all. Here's why it doesn't matter. First of all, whether Pfizer really will relinquish its No. 1 spot for prescription-drug sales is questionable. The following chart shows EvaluatePharma's sales numbers for the top three drugmakers in 2016 and estimated figures for 2022. Data source: EvaluatePharma. Chart by author. If EvaluatePharma's projections are right, there will be a virtual tie five years from now among Pfizer, Novartis, and Roche for the mantle of world's largest drugmaker. The difference between first and second place is $100 million -- the same gap between second and third place. EvaluatePharma acknowledged that "it would take only one high-profile failure to change these rankings." The firm also stated that research and development costs, changes in reimbursement to value-driven approaches, and the future role of technology, including remote monitoring and artificial intelligence, could affect the projections. There's also plenty of guesswork involved in predicting what will happen over the next five years. Even a small change in the EvaluatePharma team's underlying assumption could change the rankings for 2022. Even if Pfizer does narrowly lose its hold on the No. 1 spot among drugmakers, there are several bright spots for the company. That's especially true in the area of oncology. Pfizer's Ibrance is expected to become one of the world's top five cancer drugs by 2022, with projected sales of more than $7 billion. Ibrance could also rank in the top five drugs in overall sales five years from now. Autoimmune-disease drug Xeljanz should also perform well in the coming years. EvaluatePharma predicts that sales for the drug will double by 2022, landing Xeljanz a spot among the world's 50 top-selling drugs. Two of Pfizer's pipeline candidates could be among the most valuable assets in the biopharmaceutical industry. The company is evaluating talazoparib in a late-stage study for treating breast cancer and awaits regulatory approval for another potential blockbuster candidate, diabetes drug ertugliflozin. There are also a few silver linings in the clouds for Pfizer. While sales for autoimmune-disease drug Enbrel are expected to decline in the face of competition, it will probably still rank only behind Humira in sales for anti-rheumatic drugs in 2022. Pfizer's pneumococcal vaccine Prevnar 13 could also see sales slip some, but it's projected to retain the No. 1 spot in the vaccines market. Does it really matter if Pfizer is No. 2 instead of No. 1 in prescription-drug sales? Not really. In the bigger scheme of things, what really matters is whether the stock remains a good investment. I think the EvaluatePharma analysis points to some of the reasons that will remain true for Pfizer -- but not all of them. For example, some of Pfizer's newer products should be significant contributors to the company's fortunes in a few years. I would definitely include eczema drug Eucrisa and prostate cancer drug Xtandi in that list. Pfizer's pipeline could also play a bigger positive role than some think it will, especially cancer drug Bavencio. There's also the less-appreciated part of Pfizer's business, its essential health segment. Over the next few years, Pfizer should climb out from under the weight of declining sales for some of its legacy drugs that have lost patent exclusivity. Its biosimilars and sterile injectables businesses gained through the acquisition of Hospira could eventually help turn the essential-health segment into a growth driver for Pfizer. Last, and certainly not least, is Pfizer's dividend. Many investors aren't worried if the company's sales don't grow as fast as those of Novartis, Roche, and others as long as the dividend remains solid. If nothing else, the prediction that Pfizer will essentially be tied for the top spot in prescription drug sales five years from now should provide comfort that the company's cash flow will be able to keep the dividends flowing.